it has been four days now, and we are still living with the excitement of peter pan's remarkably unreliable intestinal pyrotechnics. i am telling you, that dog really knows how to live life to its fullest! so far one sock has resurfaced from the great and terrible panbowels, but it seems there may be more in there. how many baby socks are we missing, anyway? i can tell the city hasn't been as fun for pete this time around, and as usual, he is taking his anger out on socks. we're starting to wonder what should be done. for now, we are making sartorial decisions based on what does not involve socks (i.e., dog poison). mocs, not socks! you are hilarious. i love it. I had to throw my baby's socks away at lunch the other day. Somehow poop escaped from his body, onto his socks. I wish I had a dog to eat them at that point. too funny. i can't believe a sock made it all the way through. impressive is probably not the right word choice for that is it? and i love the mocs. 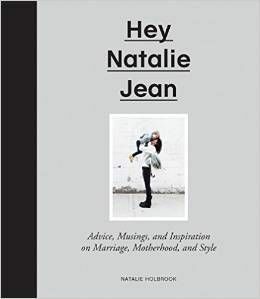 You have a very stylish baby... and your baby has a very stylish momma! Feed that dog some Chipotle. I'm telling you...those socks will come flying out! Thanks for the very best laugh of my day. Perfection, I tell you! Dude! My dumb dog ate my baby's socks too! What a strange thing for more than one dog to eat. Oh and the funniest thing is that i had the privilege of watching her pounce on one before she gobbled it down like it was her prey or something. Poor domesticated animal obviously needed some adventure in her life. Anyway, we were told to feed her canned pumpkin. It was messy but successful. Also, did you read the series "Uglies"? Sad-making made me think about the book Pretties. I love those mocs! I could get on board with the mocs for world peace. At least... not until he eats the baby moc's.. I think now that I live in Idaho it'll be easier to pull mocs off, dont you? 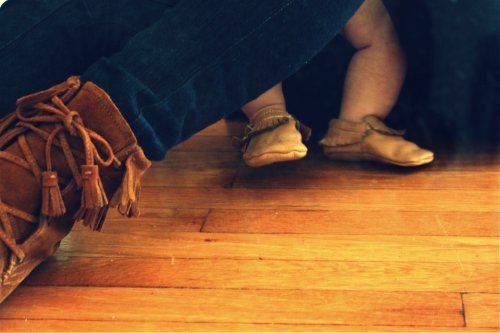 Love the baby mocs! Great idea! baby socks always fall off anyway. i just love that his name is peter pan. When I was pregnant, I did a lot of research into diapers (not only for the environment, but also for our wallet). After reading tons of reviews and a recommendation from someone who uses them I decided on Honest diapers.